The title of this post is mostly a lie. You see, I love Liege style waffles so much that I basically dedicated an entire weekend to eating them in Belgium but I had to figure out a way to make my own at home that ultimately involved as little work as possible on a weekend morning. The shiny bits are sugar that has melted and covered the outside. It’s a crunchy, candy coated waffle. It’s excellent. I tested a few ways to get the waffle from the freezer to my mouth quickly while still keeping as many of the desirable features as possible intact. Those desirable features are: delightfully crackly sugar coated exterior, steamy yeasted layers inside, and overwhelming sense of all being right with the universe. Between the carefully nurtured yeast and the pockets of melted sugar the inside of the waffle has some delightful layers. The recipe from a site conveniently located at liegewaffle.wordpress.com is outstanding, it is perfection for the home waffle maker really, and got thumbs up from friends who also have fond location-specific waffle memories. The recipe takes a number of hours spread over two days and while it’s definitely A Project it’s a project I’ll happily take on. Freeze the dough directly after the last rise and later waffle it right out of the freezer. Downside: still a little bit of work to do upon waking up, waffle iron to wash. Upside: makes the kitchen smell amazing. Result: while the exterior of our waffles were very satisfying the interiors showed signs of not quite being cooked all the way through, the dough was a little mushier than it should have been. Not unpleasantly so, mind you, just not the best. The Winner. Fully cook the waffle and freeze it. Downside: it’s just not as magical to simply defrost something. Upside: no waffle iron to wash later that day and makes frozen waffles giftable. Result: this is my pick for the way to go. The waffles were a bit chewier than just-cooked and never-frozen Liege waffles but an acceptable alternative which retained all the crunchy candy shell, yeasty goodness and feelings of universal ok-ness that were required. Heat in the oven at 275 degrees for 6 to 8 minutes (more on this below). I was honestly surprised that this worked out better than cooking frozen dough in the morning, pleased though because you can take a batch of ready-to-go frozen waffles to a friend with the reheating instructions. Do some parbaking, or parwaffling if you will, and cook the waffles just to the golden stage, then freeze. 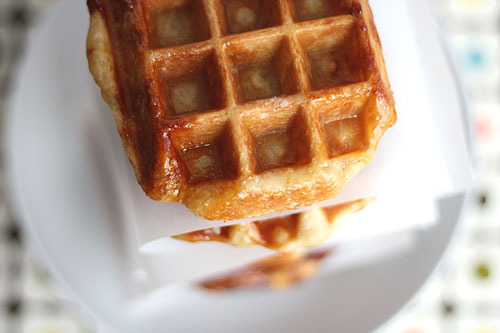 In the morning take the formed waffles and put them back on the waffle iron and finish cooking them. Downside: you’ll end up washing the waffle iron twice. Upside: as it turns out, nothing. The texture of the waffle was the worst of the three trials. Result: it was a fun experiment but skip it. I don’t want to take away from my aforementioned opinion of perfection for the Liege Waffle recipe that I used but considering my impatience-based needs I did make a few changes. Since all of the early tests produced overly chewy and too dense waffles I switched from bread flour to all-purpose flour. Since I was intending to freeze them I doubled the recipe and I also adjusted the amount of dough allowed to each waffle (basically from ten waffles to twelve waffles). A note on the time you’ll need to allow: This recipe includes some long stretches of letting the dough rise so I’ve called out the waiting times in the recipe below. The first day of work will need at least 6 and a half hours (most of this is waiting time) before you get the dough tucked into the fridge for an overnight rest so plan accordingly and don’t start this recipe in the evening. A note on protein content in the flour I used: I made my first three test batches with the King Arthur Bread Flour called for in the original recipe and found that our freshly made waffles were a bit more dense than the waffles we ate in Belgium, but our frozen waffles were very chewy. Too chewy. I switched to King Arthur All-Purpose Flour and while the frozen waffles were still a bit chewier than are ideal it was far closer to the waffles we remembered. King Arthur flours have a less than .2% protein difference between batches, their bread flour is 12.7% and their all-purpose flour is 11.7%, which is pretty high. Most brands of all-purpose flour fall near 10.5% so if you’re using a different brand you might consider subbing in a small amount of bread flour to boost the gluten amount. A note on the waffle iron: I bought myself a stovetop waffle iron specifically because I wanted something that would be easy to clean. (Conveniently it also takes up less storage space in my tiny kitchen.) Friends who have made Liege style waffles report back that cleaning up after making them in an electric iron isn’t too much work, any sugar that melts out will harden when it’s cool and your waffle iron won’t be much harder to clean than usual. 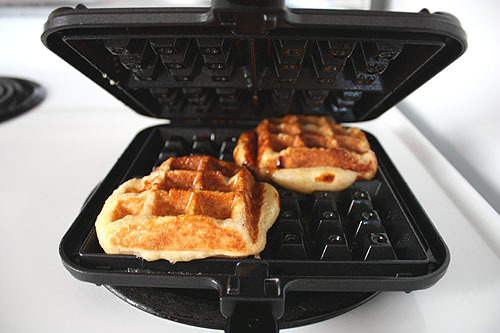 I bought the NordicWare stovetop waffle iron that is nonstick and made of cast aluminum but I’ve also had my eye on a cast iron stovetop waffle maker sold by Waffleburger (scroll down). I’ll report back if I get my hands on the cast iron one. A note on the thermometer: Since I am, as you might have noticed, a little bit obsessed with getting these waffles right I found that an infrared thermometer was essential in getting the temperature of the waffle iron to the correct range. I bought a midpriced one (it’s nicely sturdy) at a hardware store and it’s worked great. It’s also really handy when you temperature of things around you house to try to figure out why your bedroom always seems ten degrees colder than the rest of the house. This is step #3, its pretty dramatic. Recipe adapted from the Gaufre de Liège Recette Blog, which is excellent. 1. 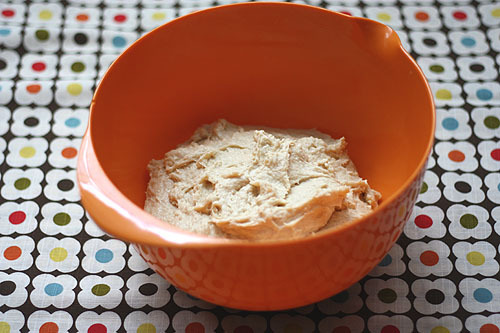 Put heated milk and water in the bowl of a stand mixer, sprinkle yeast over the top and stir to moisten. 2. Add the eggs and about 1/3rd (160 g) of the flour, mix to blend. 3. Sprinkle the remaining flour over the top of the mixture but don’t stir it in. Cover the bowl and let it stand for 75 to 90 minutes at room temperature. 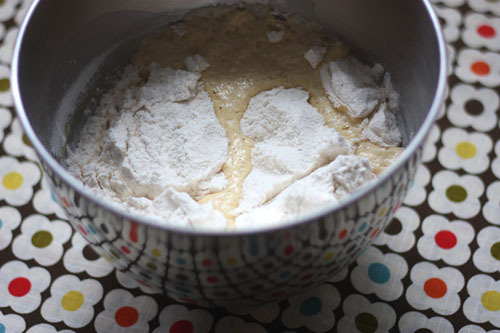 You’ll see the yeast mixture bubble up through the flour. 5. With your mixer on low speed add the honey and the vanilla. Add 2 Tbsp. (60 g) of butter at a time. Mix everything for 4 minutes at medium-low speed, scrape down sides a few times. Let the dough rest for 1 minute and mix again for 2 minutes. Do this again a few times until the dough starts to want to stick mostly to the dough hook. 6. 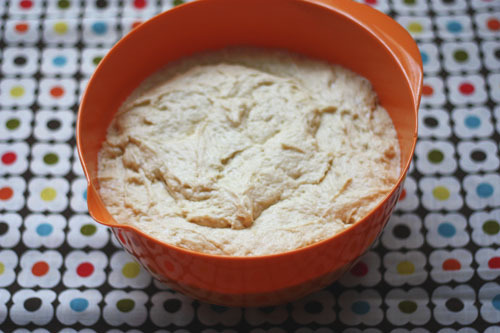 Transfer the dough into a large bowl, cover with plastic wrap and let this rise at room temperature for 4 hours. 7. Refrigerate for 30 minutes. This step is for yeast respiration, it will slow it down which you’ll need to do before the next step. 8. Using a silicone spatula press down on the dough to deflate it. Scrap this onto a piece of plastic wrap, stretch into a long rectangle and then fold into thirds. Wrap the dough tightly in plastic wrap and weight it down with dinner plates. Refrigerate overnight. 9. 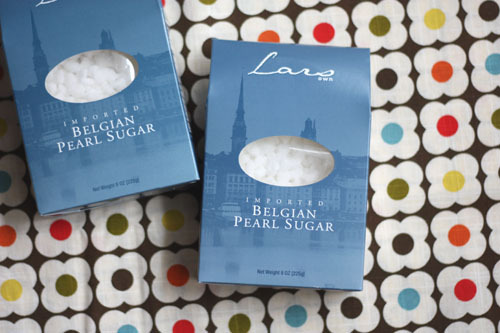 Divide your pearl sugar in 12 equal piles, about 2 Tbsp. (25 g) each. 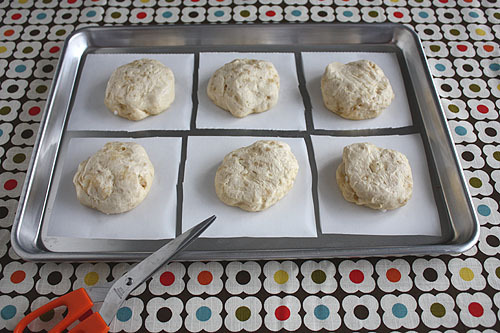 Divide the dough into 12 pieces (about 88 g each). Mix the pearl sugar into each part of dough, I usually flatten the dough, sprinkle sugar on top and fold it over a few times. 10. 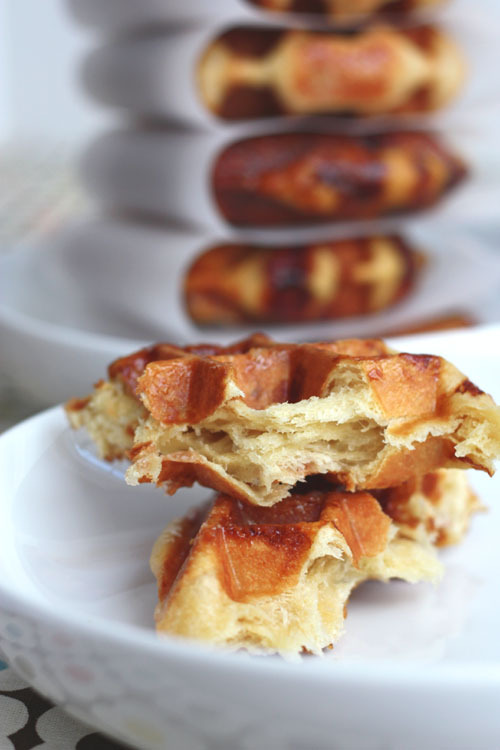 Shape each waffle into an oval lump, cover with plastic wrap and let the dough rise for 90 minutes. 11. 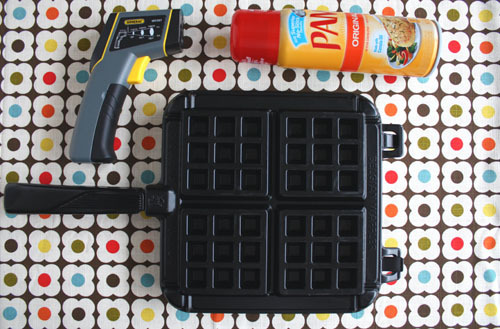 Spray your waffle iron with cooking spray. Heat until it registers at 365-370 degrees F (185 – 187 C). 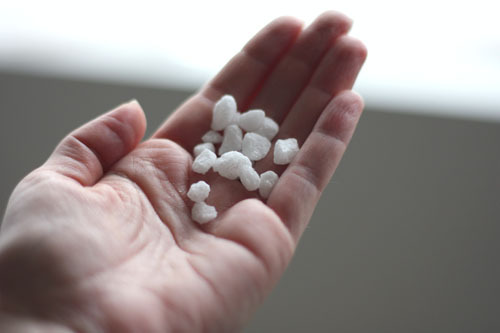 (Hotter than this and it will burn the sugar.) Cook until the waffle is dark golden brown and you can see the sugar melting and coating the outside. If you’re using a stovetop waffle iron I recommend turning it over every 90 seconds or so to keep the temperature on both sides up and allow for as much sugar to coat the exterior as possible. Carefully transfer the waffles to a wire rack to cool — be aware that the hot sugar will drip and can burn your fingers (ask me how I know) so use tongs and a flat spatula or small plate to help you move them. 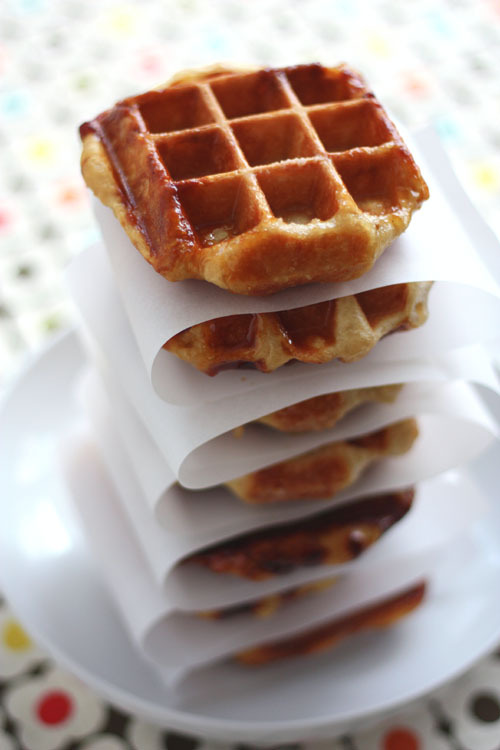 When cool tuck each waffle into some parchment paper and freeze in an airtight container. When you are ready to cook them preheat an oven to 275 degrees F and place the waffle directly onto the wire rack. Heat for 5 to 7 minutes, carefully transfer to a plate, maybe line the plate with that strip of parchment paper. I recommend the oven over a reheating in a toaster because I don’t want hot sugar to drip into your toaster. A friend reported that even at the lowest heat setting the waffles burned in her toaster oven. So, regular oven it is. 12. If you are freezing the dough to cook later: Transfer the sheet with your dough directly into the freezer and let the dough chill for at least half an hour until set. 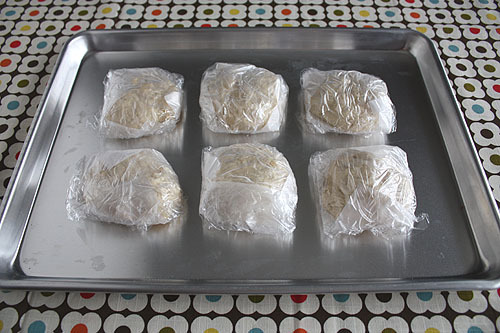 Wrap each lump of dough in plastic wrap and place together in an airtight container in the freezer. When you are ready to cook follow the directions above for cooking. I remove as many ovals of dough as I want to make and place them onto the hot waffle iron, pressing the iron down slowly to flatten them out as they thaw. 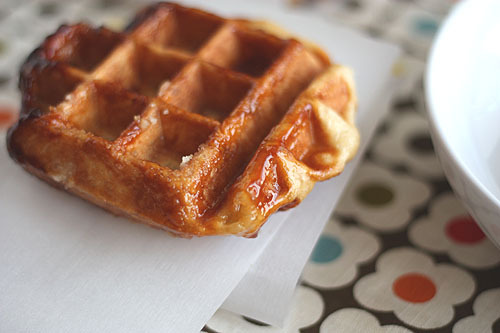 If you freeze the dough on parchment you can cut around them and use that parchment when you wrap them up, it will peel off cleanly before putting them in the waffle iron. I love brown rice but I’m too impatient to make it for dinner so I borrowed an idea from Trader Joe’s and cook it in advance and keep it in the freezer so it’s just a microwave away from being ready to eat. It’s also great to have around for a fast breakfast of an over easy egg on rice, which I default to a lot when I’m feeling lazy. I’m terrible at cooking rice in a pot (burned rice, melted pots, other tragic results) so instead I bake it using instructions from Alton Brown and Good Eats and no pots have been ruined since. 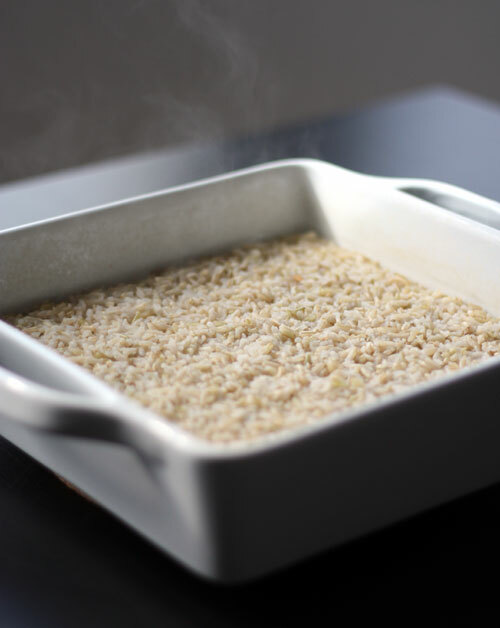 To make: Put 1.5 cups brown rice and a teaspoon of salt in an 8×8 baking dish. Pour 2.5 cups boiling water over the top, stir and cover tightly with tin foil. Bake in a 375 degree oven for one hour. Allow to cool, divide into portions and freeze. I do two or three batches at the same time and I’ve used larger baking dishes and even pie plates with good results, no need to have multiple 8×8 baking dishes hanging around. If you’re a rice texture snob this cooking method probably won’t make you happy, but hey, convenience. I recently received a KitchenAid pasta roller attachment as a gift. I asked for just the single pasta roller, none of the other cutter attachments, because my kitchen is tiny and I’m happy enough to cut my own noodles into wide strips. And if it comes down to something as thin as linguine I’m far more likely to used a boxed pasta anyhow. It is so much fun to make pasta but with all the flour being scattered about it’s worth making a whole lot of noodles at the same time. A little research tells me that freezing fresh pasta will preserve the flavor better than drying it and the best way to freeze it is in bundles or nests. Technique: Toss your just-made pasta with extra flour so it won’t stick together. Let it dry for a few minutes then fold and twist into bundles. 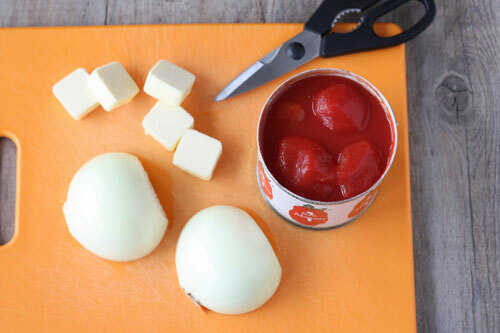 Freeze those on a parchment lined baking sheet, then transfer to an airtight container. When you are ready to cook simply drop one bundle into boiling water, the noodles should separate from each other easily. 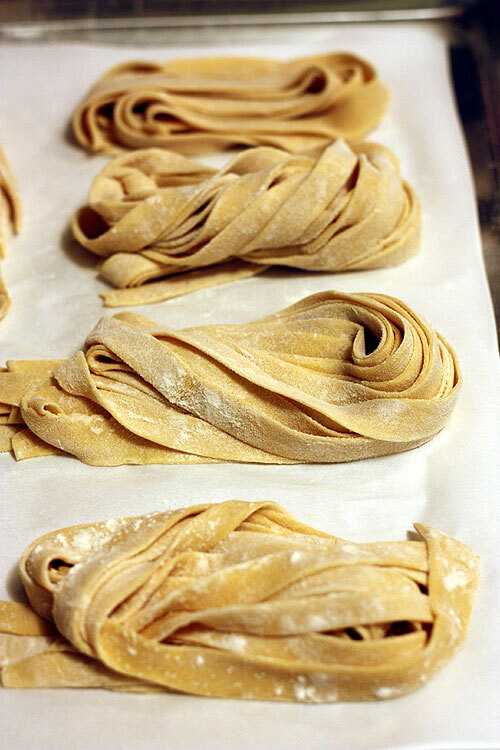 Also, voilà, fresh homemade pasta appears before you like magic! Before I did nests I decided that individual pasta strands rolled up, frozen and stacked together would be charming. And they were, but obviously they stuck together like mad in the boiling water. Oops. I have to admit something to you, I only found these because I was attracted to the packaging which is just so European-y. I was walking down the frozen foods aisle at Trader Joe’s trying to avoid looking all the delicious cookies straight in the eye and these bright red trays just screamed, “We are imported! Come fondle our clever packaging!” But I’m glad I found them because I love this stuff. 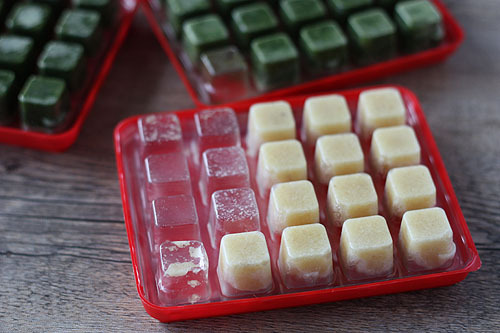 These are small frozen cubes of minced garlic or herbs which you pop out of their tray like ice cubes. So darn easy. You might not think that mincing some garlic is all that much work but my lazy self only sees a cutting board, knife and garlic press that I’ll have to wash later and on a weeknight I’d rather not. I’ll still prep fresh garlic for our slower paced weekend meals but for now I love my frozen stash. 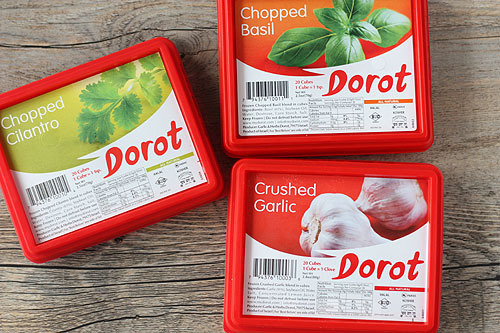 I found these at Trader Joes and, ooh, according to Dorot’s website they also have ginger, cilantro, dill and chili. This is another in the series of foods I make in bulk and freeze. This recipe came from Oprah Magazine (I have lost track of which issue), and while there are a gazillion bolognese recipes out there this is the one that ended up in my routine. I have altered the instructions a bit. Note: It takes a few hours of simmering so make it on a day when you want to be hanging out at home. 1. Finely chop onion, carrot and celery. [Right, I did that the first time, now I just run each through my food processor.] In a heavy-bottomed saucepan or Dutch oven over low heat, cook pancetta until all fat it rendered and pancetta is just beginning to brown. 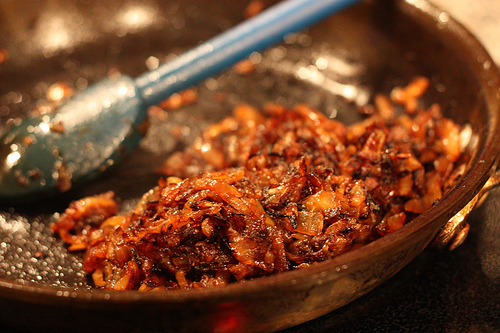 Add chopped vegetables, raise heat to medium, and cook, stirring frequently, until onion is translucent and soft. 4. Add milk. When it begins to simmer, reduce heat to low and cook at a gentle simmer, stirring occasionally until milk has mostly boiled away, about 30 minutes. [Experience has told me to add about 15 minutes to this and the next step. Am I not simmering the same way everybody else is?] Add white wine [you still have enough, right?] and cook as with milk, until it has mostly boiled away. Add tomatoes and juice, bring to a simmer. 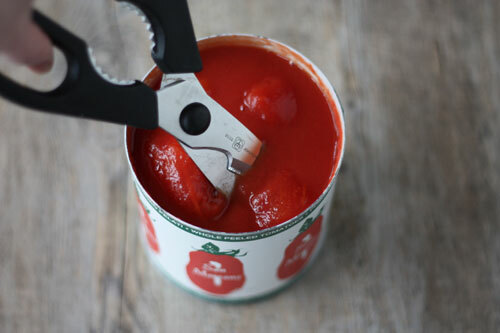 [I obsessively crush the tomato bits in the pot at this point, I bet it would be fine if you don’t do that.] Cover pot, reduce heat to low, and allow sauce to cook very gently at barest simmer, 2 1/2 to 3 hours. [I swear there is a point where you check the sauce and suddenly it just tastes like everything came together, it’s magical.] Season to taste with remaining salt. 5. Just before sauce is done, bring a pot of water to boil, salt it generously, and boil pasta according to package directions. Drain, mix with a third of sauce, then serve with remaining sauce on top with lots of grated Parmigiano cheese. 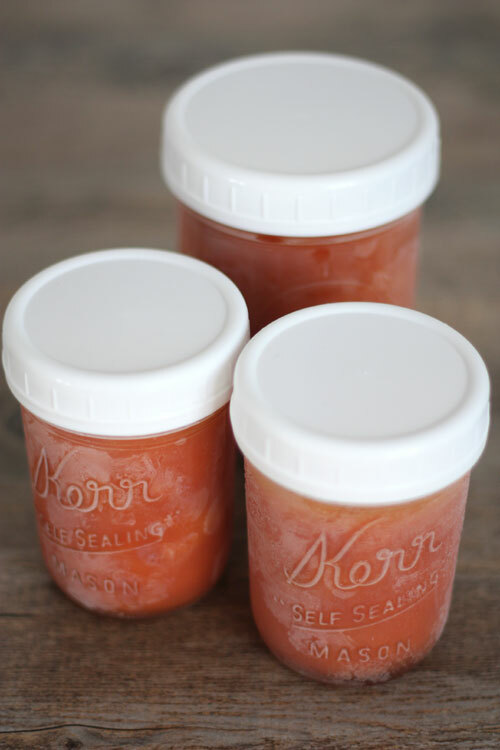 I allow the sauce to cool, then spoon into freezer bags, squeeze them flat, and freeze them on a cookie sheet until they are solid enough to be stacked on their own. When you are ready to eat you can pull one out of the freezer and run the bag under hot water to thaw. 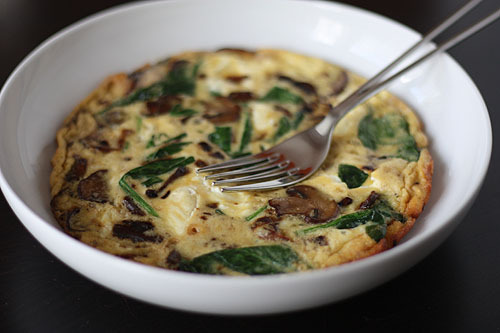 This is the easiest way to do it when you, like me, don’t own a microwave.